Picnics are perfect for summer get-togethers and a lot of fun, but you don't have to wait until you're invited to a picnic to play picnic games. They are also good for birthday parties and family fun time in the back yard. The old time picnic games will never go out of style; they are as much fun today as they were "back in the day." Here are a few of the all time favorite picnic games for you to play at your next get-together. Probably the most popular picnic game of old is the sack race. Each person gets in a sack and holds on to it around waist high. You must have a field like area with a starting position and a finish line. When someone yells GO, everyone in their sack hops in a mad dash for the finish line. The first person to cross the finish line wins. 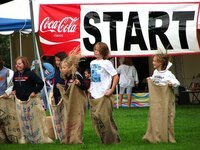 You can use the same course as the sack race as this is a team version of the game. In this game, you must have a partner. Partners stand next to each other and they both put the leg that's next to the partner in the sack, hence, three legs. When the starter says Go, the teams race to the finish line. This takes coordination and teamwork so that the legs in the sack move at the same time. Almost no one makes it to the finish line without falling. With one hand behind your back, you hold a spoon in the other. On the spoon is an egg and you must make it to the finish line without dropping your egg. You can easily turn this into a team game by having half the team on one side and half on the other. When someone gets to the other side they have to dump the egg into their teammate's spoon. When a team member drops the egg, they must start over from their start line. The first team to get all of their team members to the opposite sides while still carrying an egg wins. Using hardboiled eggs makes this game much less messy. For this game you will need a partner. One person must walk on their hands while their partner holds their feet. The two race to the finish line this way and the first team to cross the finish line wins. This is not as easy as it sounds as both people must move at the same speed or the wheel barrel collapses. Scavenger hunts have been around forever and are very popular at picnics. A list is made of many things that can be found around the area, such as a maple leaf, acorn or certain type of flower. If your picnic is at a beach you can make the list to include things like shells, seaweed or driftwood. This can be done in teams or individually and the first person to find everything on the list wins.